Years ago, I wrote an article about what I called "Holy Grails", those vastly ambitious costume projects we all dream of working on "someday". "I know you have one; we all do," I wrote. "And if we don't, we should: an idea for a costume, or one we'd like to recreate, that is way beyond our ability (or at least fiendishly fiddly), utterly impractical in timescale and budget (like reprising the work of six thousand Indian craftsmen individually sewing beetle wings onto silk for a year) and completely impractical (you have nowhere to wear it; you'd simply hang it up and gaze at it with a happy sigh)." I'm willing to bet that most of us reading this have such projects in mind. There's a book on your shelf that naturally falls open at a certain photograph; there's a folder of bookmarks in your web browser that lead to inspirational online images. "Someday," we say, "someday." But we never get around to it - it's too impractical, too expensive, too difficult, just too much all around. Why is an ambitious project worth doing? Because it is. Because we need to try these things, as artists (and make no mistake: you are an artist.) We can go through our whole lives in our comfort zones, but if we always stay there we will be avoiding the real adventures. For me, there was a catalyst that jolted me out of my safe harbour. A young artist died suddenly. He was a young man who had chosen not to do the easy projects or take the highest paying work. He did the interesting work, the work that stretched him and made him a better artist, culminating in an astounding performance that won him an Oscar shortly after his untimely death. In the aftermath of Heath Ledger's passing I was talking with another artist I know, a writer, and we agreed that we felt we ought to do something, that this ought to change us in some way. We pledged to jump outside the day-to-day work and do something extraordinary, art for art's sake. It would be good for our souls and it would feel as though we were getting somewhere, stretching ourselves and doing something that would last. We knew we had it in us somewhere. There's more inside you than what you've shown the world so far. There's more to explore than what we've all been experiencing. Embark on an adventure, and find out what you can do! This was my motivation: you're going to need inspiration that moves you just as strongly. Okay, so it took a while. I didn't drop everything and dance off immediately into a romantic sunset in which there were no bills to be paid. The normal work continued, but the seed was sown. You might have thought that the first requirement of an impossibly enormous project would be the absence of any deadline to put pressure on you, but I disagree. Without a deadline, a project falters and sinks to the bottom of the to-do list. Find a deadline, but make it a big one - an event that's big enough to inspire you to make something truly, devastatingly awesome. My debut at Costume College in Los Angeles this month means meeting all my online costuming friends for the first time, including many of you, promoting YWU to people I don't know and doing all of this on the other side of the world. Hence it's a huge, huge event for me, during which I really want to impress everyone. Make sure the deadline is a sensibly long way in the future. I decided in November 2008 to tackle this project for an August deadline. Whilst I was working on the project, people repeatedly assumed that it must be terribly difficult. "You must be so tired of it by now! "; "I bet you'll be so glad when it's done!" were comments I heard over and over. Not a bit of it. I chose a costume I'd seen in a Bath Fashion museum catalogue years before, a costume that I'd turned to and sighed at so many times, a gown that I had been so excited about for so very long that every day I got up and thought, "Yesss! I get to sew today!" 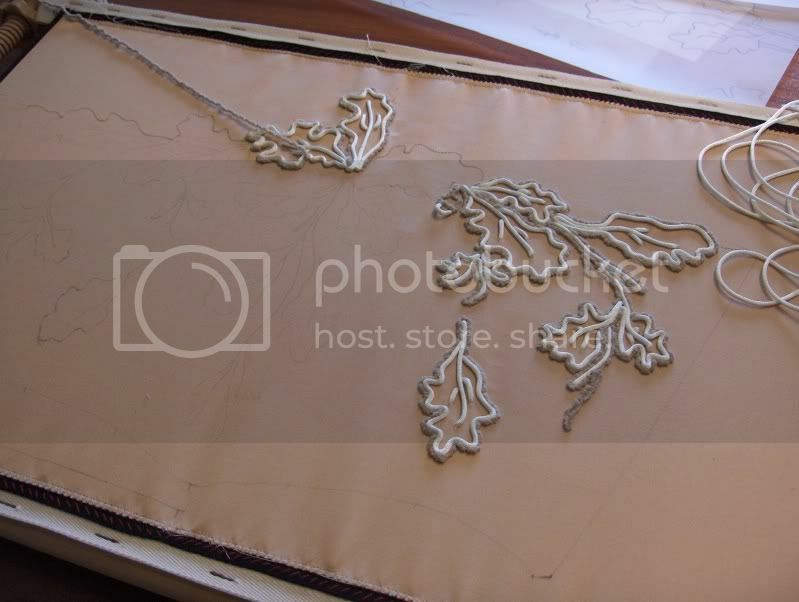 Every time I looked at my handiwork so far and saw the familiar soutache oak leaf design that I'd admired from afar for so long, it was desperately exciting to me to think that I was actually going to have my very own Oak Leaf Dress. However, I did choose something do-able. My ultimate Holy Grail is the Peacock Dress that I referenced in my original article, which is completely covered in gold bullion embroidery, but I was new to embroidery and beadwork, unsure about the timescale it would need and I honestly felt I needed to work up to it. 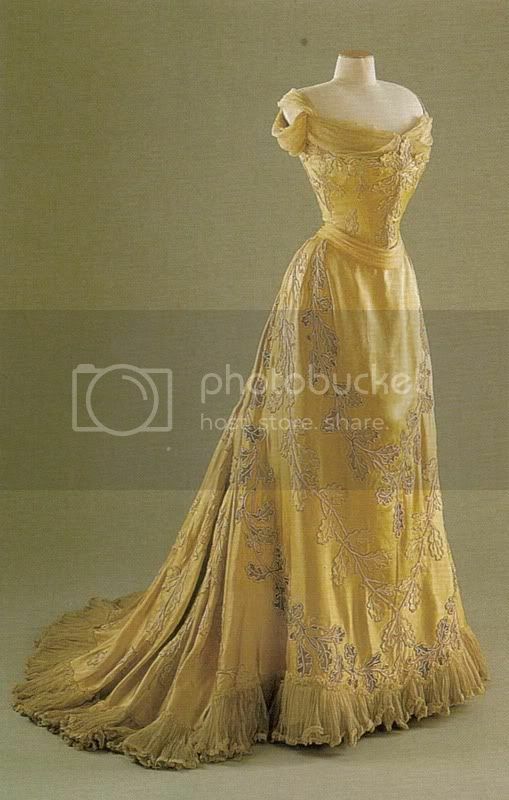 I chose instead to recreate a dress of the same period, also by Worth, that was made for the same aristocratic client. It was an equally exciting gown but involved significantly less embroidery work, so I felt that I could better set myself up for success by using this dress as a halfway house on the way to my ultimate insane dream project. At this stage, you haven't committed to the project yet; neither had I. No scary decisions yet. I simply had an event to go to and an ridiculous idea that made me giggle with barely-concealed excitement. The next step is to break it down, just for fun. 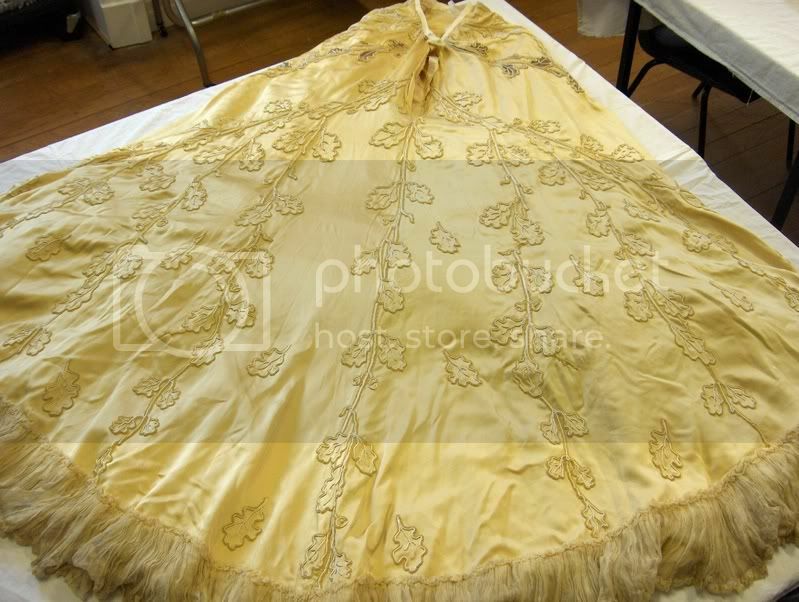 Looking at the Bath Museum's photograph of the dress (left), I thought about what might be involved if I really did go ahead and do this. What would my shopping list look like? What stages would there be in the making of the dress? At this stage, all I knew was that I'd need some gold silk of some sort, the stuff (some kind of cord?) 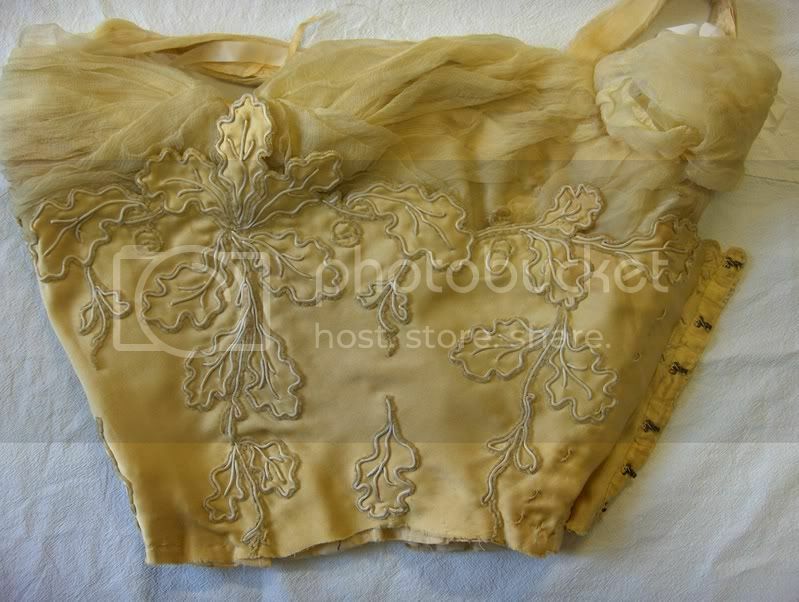 to sew on to make the oak leaf shapes, some silk chiffon (or whatever that floaty stuff was around the neckline) - and of course, the underwear of the period to give me the right silhouette. I also noticed that the first step on the list, "Make museum appointment", was astoundingly easy. What if I just did that step? I can make a phone call, I thought. I can go and see a dress, there's no commitment there. Just a day out. So I checked out the website, found out about study table appointments, and made the call. While I waited for my appointment, I made a corset. No problem. I can make a corset. I came home and wrote up my notes (right) so they made sense to me. 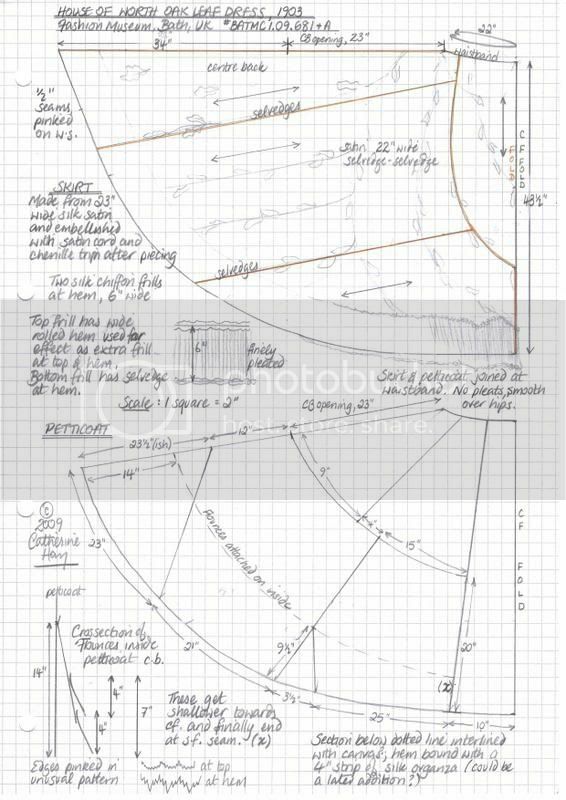 I worked out how I'd make the dress, how I'd make a pattern. I started looking for suitable fabrics, just for fun, and before I knew it I'd started buying them. Do you see what I did? At no point did I have to sit down and Decide To Commit To A Big Scary Project. It happened when I wasn't looking, simply because I was excited enough about it. I followed the first few little breadcrumbs, and the rest of the trail became irresistible. The idea of the entire project was scary, but when I broke it down, it became a journey of a thousand steps. Just one foot in front of the other, again and again and again. Of course, there were difficult elements to the project. How were those leaves done? How do you do the ones that are cut out with nothing but a bit of silk gauze behind them, and veins floating across the space, like these? By breaking it down and isolating the challenges, I could zone in on them and realise that there were ultimately only a handful of little things to figure out. Once I had worked out how to do the leaves, I could work out how to do the cutout ones, and that was pretty much the hard part done. Working out how to do it simply involved looking at the back of the original dress, knowing that if someone else did it, so could I, and consulting people who might be able to help me work it out. (People will fall over themselves to help you with an insanely big, exciting project.) I didn't have connections that you don't have, by the way - one of my helpers is an "Ask the Experts" question away, the other was an assistant at the company who wanted to sell me the cord. Between the three of us, we worked it out. And how did I keep going? How did it get done in time - in fact, with two weeks to spare? It's easier than it seems to predict the time taken and finish on time. 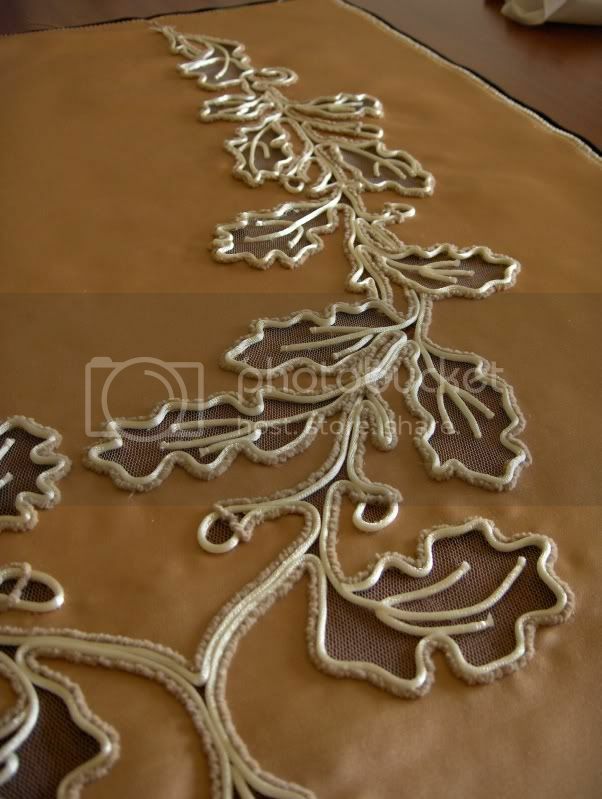 I realised early on that in many ambitious projects such as this one, the main element that makes it ambitious is a sustained period of repetitive work - making all those leaf shapes, sewing all the feathers on the Peacock dress, sewing all the beads on a bodice, or whatever it is. So the time that the work takes actually becomes quite predictable. If I knew roughly how long one leaf took, and how many leaves there were, I could work out how long they'd all take. And furthermore, as I went along I knew I'd get a little faster at sewing them, which would give me some wiggle room. I planned out a routine that, crucially, allowed time for rest and time for catching up if I fell behind: I would sew on weekdays only, catching up at weekends if I really needed to. I planned to sew at the same time every day, for the same time period. Making it a routine made it easy: I knew what I had to do, didn't have to think about it, and in fact, it became very comforting to have that certainty that if I just plugged away for that short period each day, I'd make it. The only hard part about the routine was beginning it: sitting down at the embroidery frame and switching the radio on at the same time each weekday. Again, a big, scary project was broken down into such small chunks that I only had to think about one little bit at a time, allowing the big picture to take care of itself. I knew how many leaves I had to sew, how long each leaf would take, and I knew how many days I had to do it. I would have to sew six leaves per day, and with each one taking about 45 minutes, I'd need four and a half hours each day plus breaks. I blocked out time each day that would make it easy for me to finish on time, and made sure that time period was at my best time of day - I'm a morning person, so I'd begin at 7am and work until lunchtime at 12.30, pulling out of as many commitments as possible in order to make the time. I planned to have at least a week free between finishing the gown and arriving at the event. I made heavy use of my radio to keep my mind busy, varying stations from time to time. Sometimes I finished all I needed to in the time allotted; sometimes I got ahead; sometimes I fell behind and caught up on weekends. I began sewing leaves on April 1st, and finished them on July 1st. One day at a time, and before I knew it, they were done and I was almost there. At this point I made a couple of small mistakes, so this is the point at which you'll have to make a mental shift too, as I did. Up until this point I'd pretty much tricked myself into working on a very ambitious project, one step at a time. But as I finished the leaves, the enormous happy-scary realisation came over me that I was actually in serious danger of really, truly completing a devastatingly awesome dress and succeeding in my most complex project to date. This was a lot to take in, and I think that's why I began sabotaging it. I took a break; I let it sink in for a day or two, and so should you if you go through this stage. Then keep going, just one small step at a time. It'll be done soon. And when it really is done, of course, you'll need to know when to stop. I'm sure you've experienced the unwillingness to finish a project before. There's always something more to do, and something more, and it never quite seems done. The feeling will be magnified here. Take a step back; let it be done. Don't underestimate the post-project depression, too - start to plan your next project before you complete this one, and you may be able to avoid completely the feeling of emptiness that follows a big win. And then celebrate. You will be surprised at what you've become, and you'll need to adjust to what you now know you're capable of. Congratulations on completing a wonderful journey of growth, and enjoy your astounding new creation! ♣ Inspire yourself enough to need to try something extraordinary. ♣ Pick a big, inspiring deadline, at least a few months away, that excites you. ♣ Pick a truly awesome project that you're not sure you're capable of. It will help enormously if you've been fawning over the idea for years. ♣ Ensure that it's doable, but not too doable. It must sit at a slightly uncomfortable point on the scale from insane to impossible: stretch yourself, don't kill yourself. Gut feeling will be your guide - go for something that elicits involuntary leaping about accompanied by maniacal giggles, not a heavy, sinking feeling! ♣ Don't make a scary decision to go for it: instead, play with it. Make pretend plans. Make a brief, simplistic numbered to-do list - "1: Make bodice. 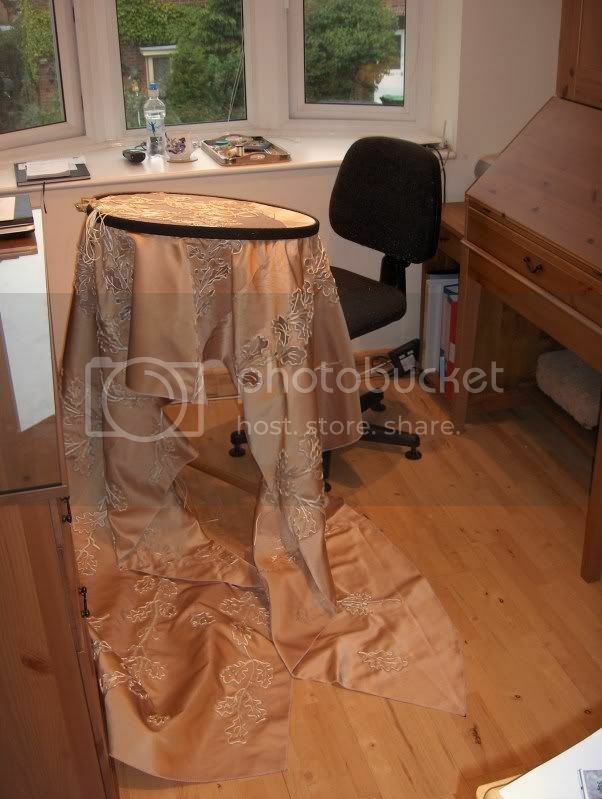 2: Make skirt." ♣ Break each task down into more steps. Keep breaking it down as far as you can, such that each step gets easier and easier. Write a pretend shopping list. ♣ Keep doing another step, and another, until the project seems to take on an excitable momentum of its own. ♣ There will be some challenging steps - "8: Make 100yds bobbin lace" - isolate these from the rest of the project in your mind as small component tasks of the bigger picture. Get some help, ask advice, buy a book, work them out bit by bit, as if you're gradually teasing out a knot in a piece of yarn. ♣ Break the workload down, concentrating on the most repetitive and time-consuming tasks. 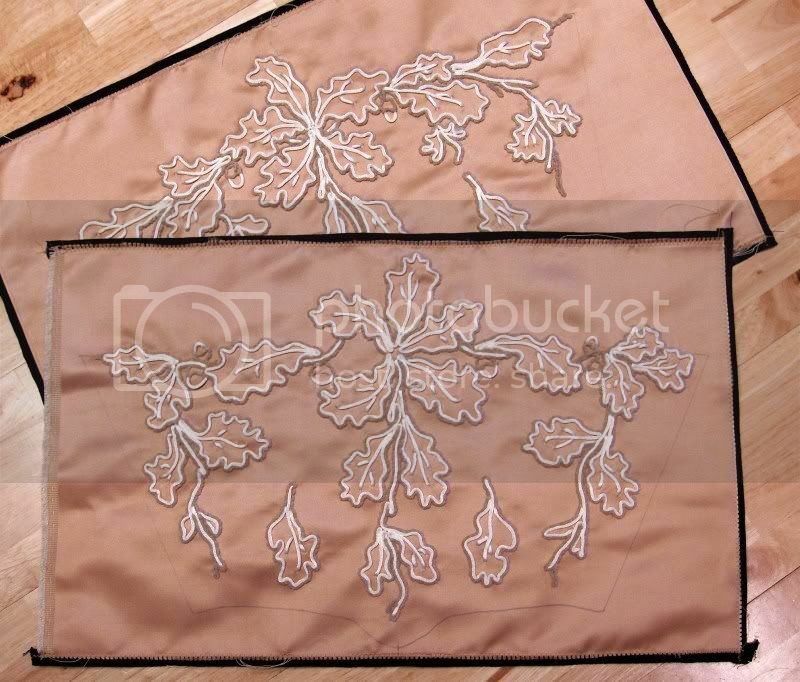 Can you break them down into a series of repeated tasks (like my soutache oak leaves)? How long does each unit of work (leaf) take, how many units are there altogether, and how many work days do you have? From this you can work out how much time a day to plan. ♣ Don't plan to work every day. Breaks will keep you sane, save your hands and eyes and allow you to catch up if you fall a little way behind. Plan at least a week's break between completing the project and your deadline. ♣ Make the work a routine, done at the same time each day. Concentrate each day on just that day's work, and relax about the big picture. You know now that each day's work, done to plan, will get you there on time. ♣ Watch out for the moment when you're almost done, and mistakes come as you realise you might actually succeed. Take a break for a day or two, let it sink in a little, then return to your routine. ♣ Expect and plan for the usual finishing problems to be magnified - the handfinishing will take longer than you think; you'll have trouble calling it done; you'll feel empty afterwards. You know what to do to avoid these being problems for you. ♣ Make sure you celebrate. If it feels like an anti-climax, put the finished project away for a week or so and then get it out again. With fresh eyes, your achievement will become much clearer. Well done! 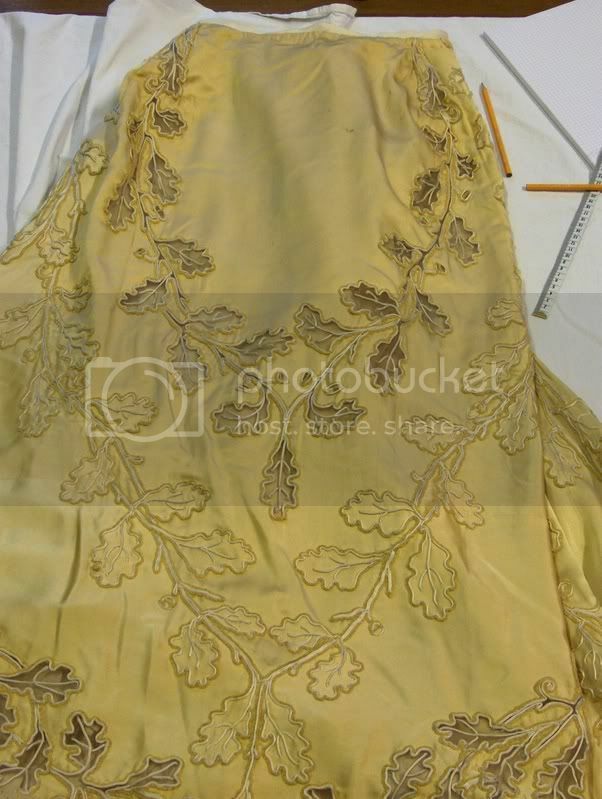 Read my dress diary about the Oak Leaf Dress, including progress pictures and details about its history, at my blog. I'll add photos of me in my finished gown after Costume College, in early August! Great work Cathy!and it is so encouraging to know how to go about such a project. I love the cut of the skirt and use it a lot as the starting shape for wedding and bridesmaid dresses - always looks good- but I did not know it was also used by Worth! Marvolous!! Your dress was one of the best ones there. Thank you for sharing. Each year someone raises the bar on the quality of costumes, and I think you won the prize this year. Val- whose black bustle gown sleeve became your best friend.